The Affidavit of Original Work agreement is used when you need a signed statement from an author stating that the material they provided is an original work of that author. You can not always take an authors word that what they provided is unique, it could have been lifted from another source. At the very least, get it in writing that the author can not refute at a later date. This version is used when it is known that non-original works are included in the material provided by the author. For example, if the author is doing research and is including reference material that they did not create themselves. The non-original works are identified separately from the original works so there is no confusion over what you have rights to use as original work. This version also includes a copyright release for the original works and indemnification. This Affidavit of Copyright with Release (Non-Original) is included in editable Word format that can be customized in Word or by using the included Wizard software. I reside at current address information here. I am the Original Author of the following list of works and materials (see complete copies attached as Exhibit B), which were created between period of time during which copyright was established, or when authorship took place for intent or reason for creation: publication, works for hire, resale. Brief history of the creation or lifecycle of the documents or original work. Any registrations, copyright dates, publication dates, or other supporting evidence if available. Library of Congress copyright registration certificates will have a number such as: TX 5-939-0022. Copies of all registrations and publication dates have been attached as Exhibit B. Further, the following list of works, provided to Company by the Author, are not original works (i.e., they are "Non-Original Works"), or Author's claim to ownership cannot be verified and shall be identified as such. Copies of all Non-Original Works submitted to Company by Author have been attached as Exhibit E. Nothing in the works and materials listed in Exhibit B contains any content that infringes or violates any intellectual property rights of any third party or author. Further, nothing contained within the work or materials or any part or operation of the materials will cause the use, reproduction, resale, or transfer of the rights to the materials to infringe upon the intellectual property rights of any third party. I hereby grant and quitclaim to Company Name the absolute and irrevocable right and unrestricted permission to use, re-use, display, distribute, transmit, publish, re-publish, copy, or otherwise exploit, in whole or in part, either digitally, in print, or in any other medium now or hereafter known, for any purpose whatsoever and without restriction, the materials listed in Exhibit B currently owned or created by me, or in which my labor is included; to alter the same without restriction; and to copyright the same. I understand and agree that Company Name may or may not use my name in conjunction with the materials as Company Name so chooses. I hereby release and discharge Company Name and its agents, representatives, and assigns from any and all claims, obligations, or demands arising out of or in connection with the use of the materials listed in Exhibit B, whether monetary or otherwise. 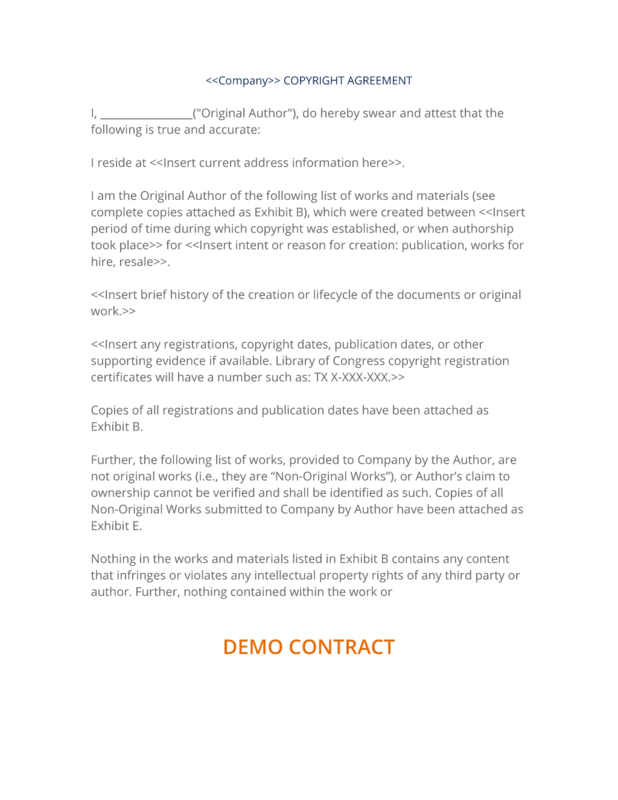 The complete Affidavit of Copyright with Release (Non-Original) - with the actual formatting and layout - is available in this Contract Pack.